The Great Seal of the State of West Virginia was adopted in September 1863. The obverse center of the seal contains a boulder that has been inscribed June 20, 1863, the date West Virginia became a state. In front of the boulder lie two crossed rifles and a liberty cap as a symbol of the state's fight for liberty. The two men on either side of the boulder represent agriculture and industry. On the left stands a farmer with an ax and plow before a cornstalk. On the other side stands a miner with a pickax, and behind him an anvil and sledge hammer. The outer ring contains the text "State of West Virginia" and the state's motto "Montani Semper Liberi", ("Mountaineers are Always Free"; the state nickname is "the Mountain State"). The reverse of the seal, also called the lesser seal, is the official seal of the Governor. Its motto reads "Libertas E Fidelitate" ("Liberty out of Fidelity"). 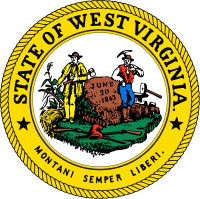 Montani Semper Liberi (Latin for "Mountaineers are Always Free") was adopted as the official motto of West Virginia in Article II, Section 2-7, of the state constitution signed in 1872. This article specifically states: "[t]he present seal of the state, with its motto, "Montani Semper Liberi," shall be the great seal of the state of West Virginia, and shall be kept by the secretary of state, to be used by him officially, as directed by law". The phrase was suggested as the motto by Joseph H. Diss Debar, the artist who created the state's Great Seal. Montani Semper Liberi is also part of the coat of arms for the Colombian city of Bucaramanga. ^ "West Virginia Statistical Information" (PDF). State of West Virginia. Retrieved 2014-06-20. ^ "Constitution of West Virginia". West Virginia Legislature. Retrieved 2014-06-20.